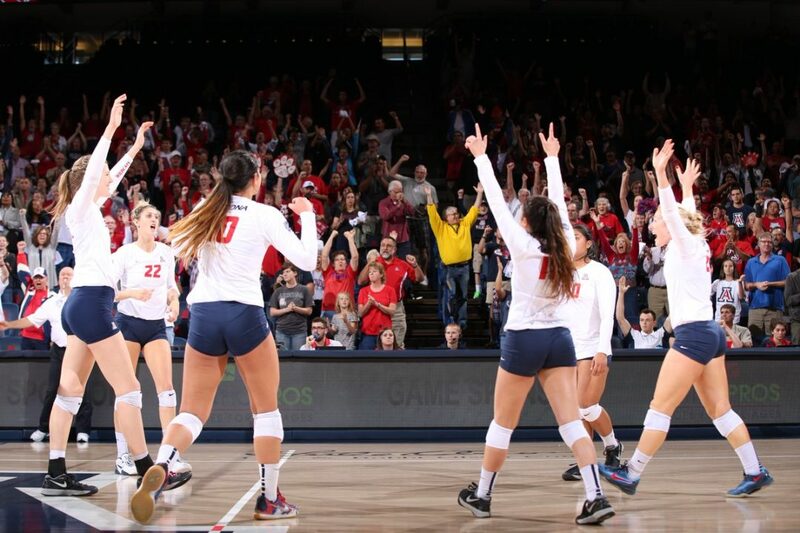 18th-ranked (21st AVCA) Arizona volleyball (14-2, 3-1 Pac-12) returns home after three straight matches on the road to host a pair of ranked teams in McKale Center this weekend. The Wildcats take on No. 14 (AVCA 15) Washington (11-3, 3-1 Pac-12) and No. 20 (AVCA 22) Washington State (11-3, 2-2 Pac-12) in what will be the first two top-25 matchups in McKale Center since No. 23 UA defeated No. 11 UCLA in five sets on Nov. 22, 2015. The Wildcats take on the Huskies at 6 p.m. on Friday and the Cougars at 12 p.m. on Sunday. Arizona secured the rare Pac-12 road sweep last week, going to Oregon and winning at No. 12 Oregon (3-2) and Oregon State (3-0) for their first 2-0 trip to the Beaver State since 2010. Arizona became the first team to sweep a Pac-12 road trip this season. A full recap of the sweep can be found on page 4. Kendra Dahlke was named Pac-12 Offensive Player of the Week for her efforts on the weekend. She posted 40 kills over the eight sets and had just eight errors on 118 swings (.271). Dahlke, who had double-doubles in both matches, received the honor for the first time in her career. Arizona improved to 14-2 on the season; UA has already eclipsed its win total from 2017 (11) and already has twice as many Pac-12 road victories this season (2) as last year (1) in just three tries. The Wildcats were the biggest movers in the AVCA Top 25, moving up three spots from No. 24 to No. 21. UA is making its 316th appearance in the poll, 10th most in the NCAA. UA is the only team in this week’s AVCA Top 25 to have finished 2017 with an under .500 record; every other team currently ranked won 18 or more matches last season (Arizona went 11-18). Arizona’s 14-2 start marks its best 16-match start since 2014. This marks the fifth time in school history that the Wildcats have won at least 14 of their first 16 matches: 1998 (14-2), 2000 (14-2), 2005 (14-2) and 2014 (14-2). Earlier this season, head coach Dave Rubio became the second coach in Pac-10/12 history to surpass 500 career wins as a league coach, winning No. 500 vs. New Mexico State (Sept. 14). He’s now at 504 for his career entering this week. The Wildcats enter the week sixth in the nation (and third in the Pac-12) in kills/set (14.69). Since sets were reduced from 30 to 25 points in 2008, Arizona’s best offensive mark for a season was 13.94 kills/set, done twice (2015, 2016). Senior outside hitter Kendra Dahlke is having a nearly unprecedented start to 2018. Dahlke leads the Pac-12 and is third in the nation, averaging 5.18 kills/set, and leads the league in points/set (5.44) and double-doubles (11). She has had at least 15 kills in 13 of the 15 matches she has played in this season, including the first 11 matches, the longest 15-plus-kill streak in school history. Dahlke’s 285 kills this season include her 1,000th in her career; she became the 18th player in school history reach the 1,000-kill milestone in week 2 vs. Lipscomb and now has climbed into 10th in Arizona history in career kills (1,206). The senior enters this weekend seven kills shy of ninth place (Melissa McLinden – 1,213). Devyn Cross is one of two players in the Pac-12 hitting better than .330 and averaging more than 1.20 blocks/set. Cross ranks fifth in the league in hitting percentage (.359) and eighth in blocks/set (1.23). Much of Arizona’s offensive success to start the season can be attributed to junior setter Julia Patterson, who currently sits third in the Pac-12 and 12th in the NCAA, averaging 11.45 assists/set. Despite having the conference leader in kills and attempts per set (Kendra Dahlke), Patterson spreads the sets around. Seven different Wildcats average more than 1.2 kills per set (Kendra Dahlke – 5.18, Paige Whipple – 2.87, Devyn Cross – 2.23, Elizabeth Shelton – 2.14, Katie Smoot – 1.92, Shardonee Hayes – 1.31, Candice Denny – 1.29), which, along with Cal, is the most in the Pac-12 (min. 26 sets). Arizona’s offense ranks third in the Pac-12 in kills (14.69/set), third in assists (13.26/set) and fifth in hitting percentage (.257) after finishing 11th (12.50 kills/set), 11th (11.56 assists/set) and 12th (.204 hitting percentage), respectively, in the league in 2017. While the hot start for the UA offense has been notable, the Wildcat defense has been impressive as well to start the season. Arizona has held 12 of its last 16 opponents under .200 hitting and currently ranks second in the Pac-12 in opponent hitting percentage (.171). UA is in the top half of the Pac-12 in digs per set (5th – 15.64) and blocks (5th – 2.43). Arizona is 7-0 this season at home and has only lost one set in the six matches. Arizona is looking to return to the NCAA Tournament in 2018. Prior to missing the tournament last year, UA had been to seven of the previous eight NCAA Tournaments, highlighted by a Sweet 16 run in 2016. In all, Arizona has been to the NCAA Tournament in 19 of head coach Dave Rubio’s 26 years and 28 times overall. Washington holds a 46-20 all-time lead in the series with Arizona. The Huskies swept the Wildcats in their lone meeting last season (full recap on page 5) and have won 13 straight meetings between the two clubs. The Wildcats have won 63 of the 83 meetings all-time vs. Washington State, but the Cougars have won the last three in the series, including a four-set victory in Pullman (full recap on page 5) in the two teams’ lone meeting last season. No. 15 Washington (11-3, 3-1 Pac-12) won its first three matches of the Pac-12 season before dropping a four-setter to Utah in its last matchup entering this weekend, which ended UW’s seven-match winning streak. The Huskies lead the Pac-12 in service aces (1.76/set) led by the Pac-12 leader Destiny Julye (0.41/set). No. 22 Washington State (11-3, 2-2 Pac-12) swept Utah (3-2) and Colorado (3-1) last weekend, ending a three-match losing streak, WSU’s only three losses this season. The Cougars are dominant at the net; they are third in the league in blocks (2.60/set), second in hitting percentage (.263) and fourth in opponent hitting percentage (.179). Taylor Mims leads the team and is fifth in the Pac-12 averaging 3.98 kills/set. Arizona moved up in the AVCA Top 25 this week from No. 24 to No. 21, its highest ranking since finishing the 2016 season ranked No. 20. The Wildcats have been ranked 316 weeks in the AVCAP Top 25, dating back to 1982, the 10th-most among all schools in Division I. The Pac-12 has eight schools ranked in the top 25, the most among all conferences. UA is 1-1 vs. ranked opponents this year. The Wildcats checked in at No. 35 in the first NCAA RPI of the year. At this season’s Wildcat Classic, Arizona head coach Dave Rubio won his 500th match at Arizona, becoming the second coach in Pac-10/12 history to reach 500 career victories as a coach in the league, joining legendary UCLA coach Andy Banachowski (619 wins, 1986-2009) as the only ones to reach the milestone. Rubio also joined a legendary group of Arizona coaches to win 500 games as a Wildcat: Mike Candrea (softball; 1986-present), Jerry Kindall (baseball; 1973-1996), Frank Sancet (baseball; 1950-1972), Lute Olson (men’s basketball, 1983-2007) and Fred Enke (men’s basketball; 1925-1961). Including his 122 victories at Division II Cal State Bakersfield, where he began his career from 1987-1991, Rubio has won 626 matches. Those 624 victories rank 20th among all active Division I coaches. Kendra Dahkle leads the Pac-12 in kills (5.18/set), points (5.44/set) and double-doubles (11). It is believed that no Wildcat has led the league in all three categories (double-doubles were not tracked historically). Julia Patterson is third in the conference and 12th nationally, averaging 11.45 assists/set. In just over one year as UA’s starting setter, Patterson has already cracked the Arizona career top 10 in assists (10th – 1,709). Devyn Cross is fifth in the Pac-12 in hitting percentage (.359) and eighth in blocks (1.23). Thirty-nine of Cross’ 70 blocks have come in the last seven matches, a stretch in which she’s averaging 1.56 blocks/set. Makenna Martin ranks eighth in the Pac-12, averaging 3.85 digs/set. She led UA in digs in 2017 (2.87/set). Arizona was one of the youngest teams in the country a season ago, when UA started three freshmen and two sophomores. A year later, the Wildcats gained experience, but in the big picture, remain one of the youngest teams in the country. UA has 13 underclassmen (7 freshmen, 6 sophomores). This, along with UCLA, is the most in the Pac-12. Arizona returns all six starters and its libero, seven of 11 returning letterwinners, from last season. The Wildcats are the only team in the Pac-12 to return all six starters from last year. The Wildcats return 78% of their kills (1,057-of-1,363), 93% of their assists (1,177-of-1,260), 73% of their digs (1,102-of-1,502) and 76% of their blocks from last season. Arizona’s freshman class in 2017 was one of its best in school history. Four freshmen (Paige Whipple – 213; Elizabeth Shelton – 187; Candice Denny – 106; Katie Smoot – 71) had more than 60 kills last year for the first time in school history. Candice Denny had the third best hitting percentage in UA freshman history (.302) and Paige Whipple had the ninth most digs (213) by a freshman in school history to go along with her 213 kills. After leading the Wildcats in total kills in each of the last two seasons, Kendra Dahlke is looking to rewrite the Wildcat history books. In week 2, Dahlke became the 18th player in school history to record 1,000 career kills. Dahlke, who already finds herself in the UA record book for a big 2016 season (125 sets played, 7th; 496 kills, 9th; 28 10+ kill matches, 4th; 1,331 attempts, 7th), can put her name on a variety of UA career top 10s as well.